I knew I'd use this to make bread, which is a great easy gift to whip up, and you can save a lot of money making it yourself, but I use it all the time. I love that I can just throw stuff in there and trust the machine to do the hard work. And the optional attachments I bought for mine have upped my game in the kitchen. 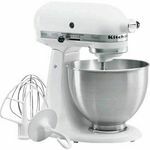 I am constantly baking so I use this mixer all the time. This is my second one and it lasts really well and I love the attachments. I would buy this product again, no issues and works great!! I use this product as much as I can. Use it to shred chicken breast. Only issue it is very heavy and the mixers don't reach the bottom. Overall it's a great mixer. 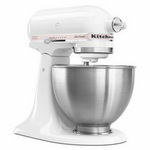 I use the KitchenAid mixer for anything and everything I can use. 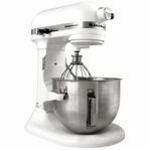 Love this mixer! Capacity is great! There's a reason this thing has a 5 star rating! The price tag is high but it is so worth it. 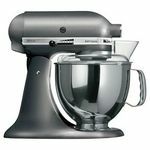 This appliance does all the hard work for you and makes any type of cooking/baking a breeze! I use it for shredding chicken to put on fajitas, grounding my cook ground beef up to make a sauce out of, mixing the cookie dough so I don't have to break my arm...and so much more. 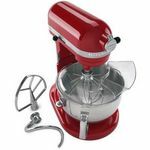 This is my all time favorite kitchen appliance! I bake cakes as a hobby, and I always use fondant. I've killed many mixers making fondant, but this one has never had any issues at all and mixes so beautifully and smoothly. Not a super loud machine. The attachments are very simple to use and wash.